Intensive glossy colour and a creamy texture for lips that love to smile. Our Liquid Lip Colour fills your lips with an uplifting pink or a cheerful coral. The creamy texture of these high-spirited liquid lipsticks provides both care and shine. For an even more uplifting look, combine Dr. Hauschka Liquid Lip Colour with one of our Eye Crayon Duos and the new Bronzing Glow Powder. 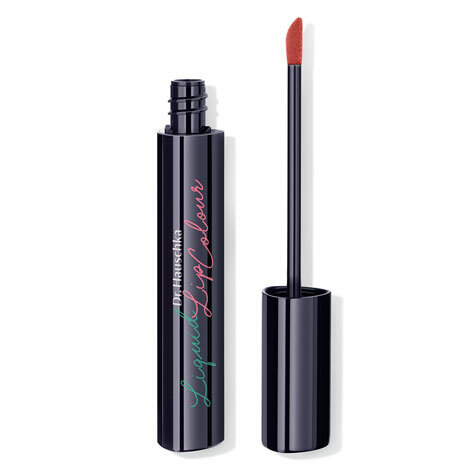 The creamy texture provides rich colour with intense shine and feels pleasant on the lips. Mineral pigments and medicinal plant extracts, particularly of anthyllis, are combined with mango butter and apricot oil to leave lips feeling wonderfully soft. The Limited Edition High Spirits is available for a short time only as an addition to the Dr. Hauschka Make-up line. Ricinus Communis (Castor) Seed Oil, Lanolin, Prunus Armeniaca (Apricot) Kernel Oil, Anthyllis Vulneraria Extract, Cetyl Alcohol, Hydrogenated Castor Oil, Euphorbia Cerifera (Candelilla) Wax, Mangifera Indica (Mango) Seed Butter, Fragrance (Parfum)*, Linalool*, Benzyl Benzoate*, Farnesol*, Limonene*, Geraniol*, Eugenol*, Benzyl Salicylate*, Benzyl Alcohol*, Citronellol*, Prunus Amygdalus Dulcis (Sweet Almond) Oil, Beeswax (Cera Alba), Hippophae Rhamnoides Fruit Oil, Mica, Silica, Calcium Aluminum Borosilicate, Maltodextrin, Tin Oxide, Carmine (CI 75470), Iron Oxides (CI 77491), Titanium Dioxide (CI 77891). Apply along the curve of the bottom lip, press the lips together and then fill in evenly.